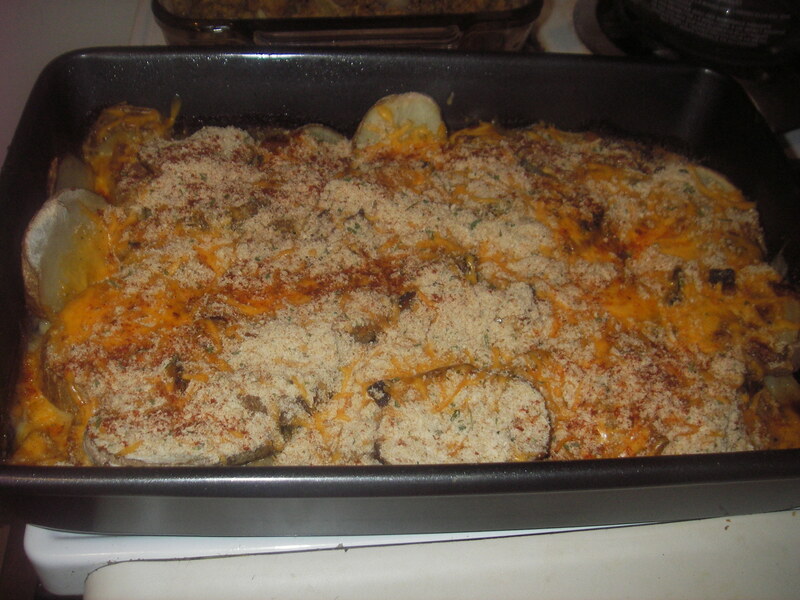 My family always referred to my aunt’s au gratin potatoes as ‘heart attack’ potatoes. She always joked that this was why she only made them twice a year at Thanksgiving and Christmas. Well, they are just so AMAZING that I hated waiting all year to have just twice back-to-back so quickly. 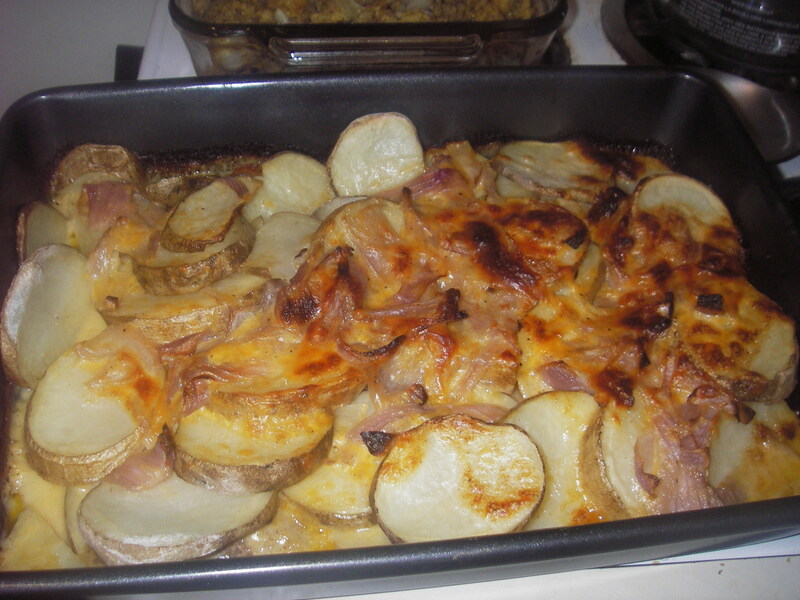 So this year I set out to find a less ‘heart attack’ friendly au gratin potato recipe that was still as delicious, and while this is not the least fattening thing I have ever made it sure is DELICIOUS! I started by scrubbing 3 large potatoes, which weighed a little over 2 pounds. 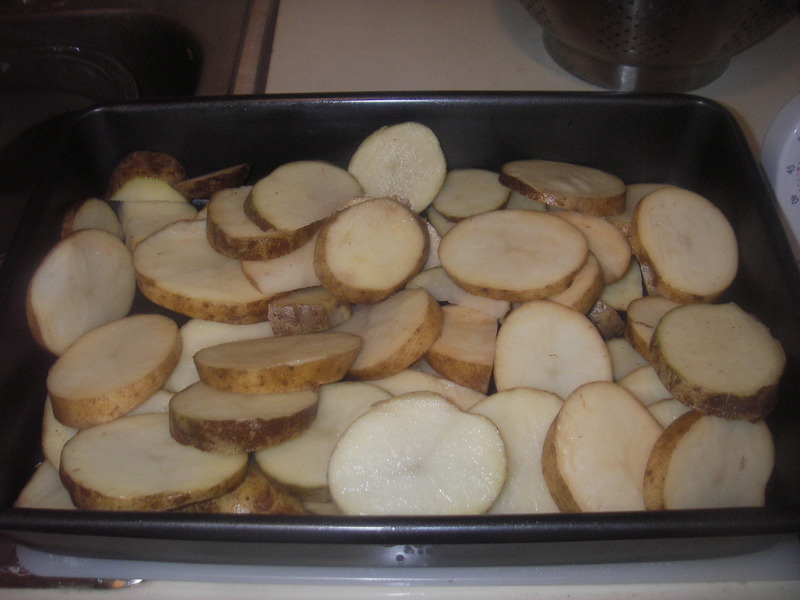 I then cut them into about 1/8th to 1/4th inch slices, and spread them in a baking dish. I then set to work on the sauce. I melted the butter in a large saucepan, and then added the onion. I let the onion cook for about 5 minutes, until it was tender. This time I DID NOT set off the smoke alarm! 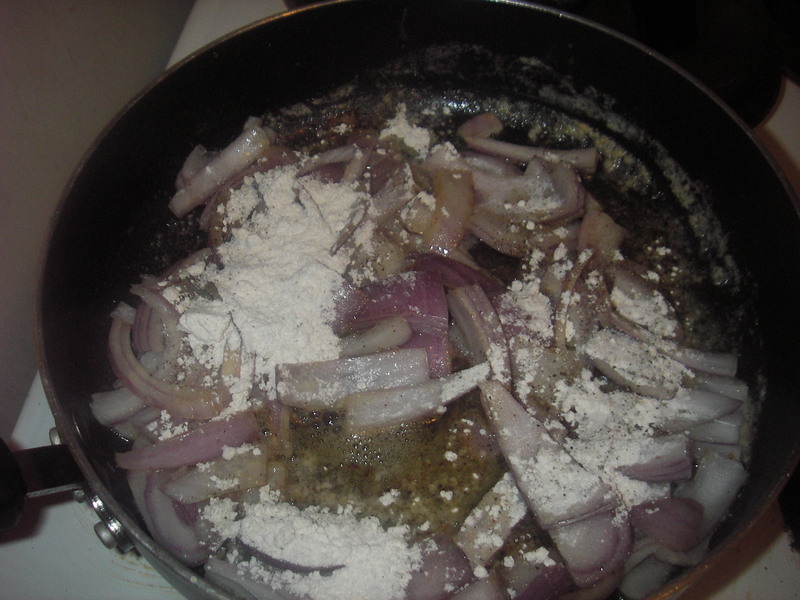 Once the onion was tender, I added the flour, salt, and pepper. I stirred this continuously until it started to bubble. 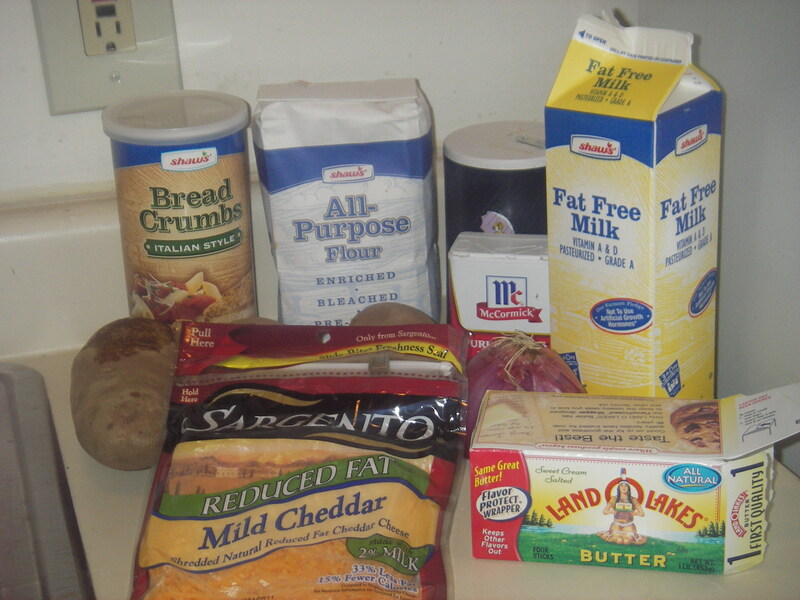 I then removed the mixture from the heat and added the milk, and 2 cups of cheese (I used more cheese than the recipe called for, cause I LOVE cheesy potatoes). 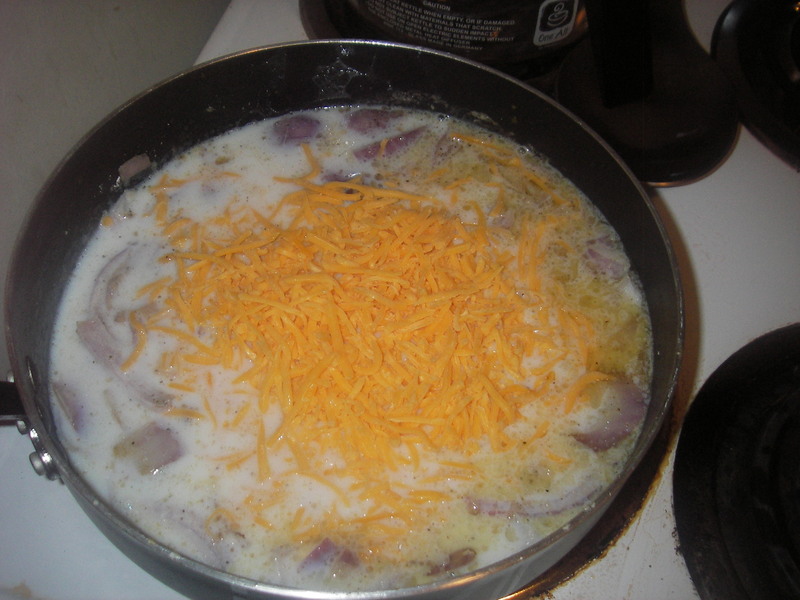 I heated this mixture to boiling, and let it heat until the cheese was completely melted. I stirred it constantly, since I didn’t want to set off the smoke alarm again. 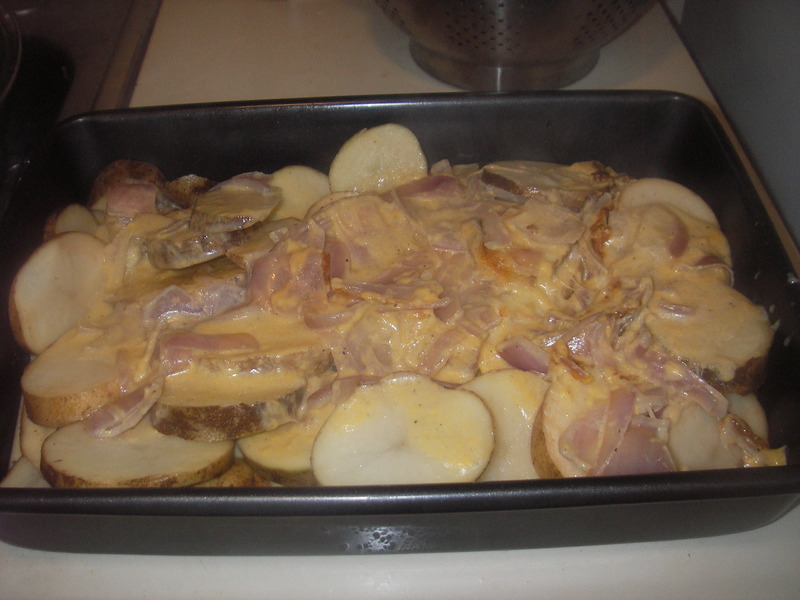 Once the cheese was completely melted I poured the mixture over the potato slices in the baking dish. I baked the potatoes and cheese mix at 375°F for an hour. After I took the potatoes out of the oven I immediately poured 2 cups of shredded cheddar cheese of the top of them, as well as the bread crumbs, and paprika. Once the cheese melted, the potatoes were ready to serve! 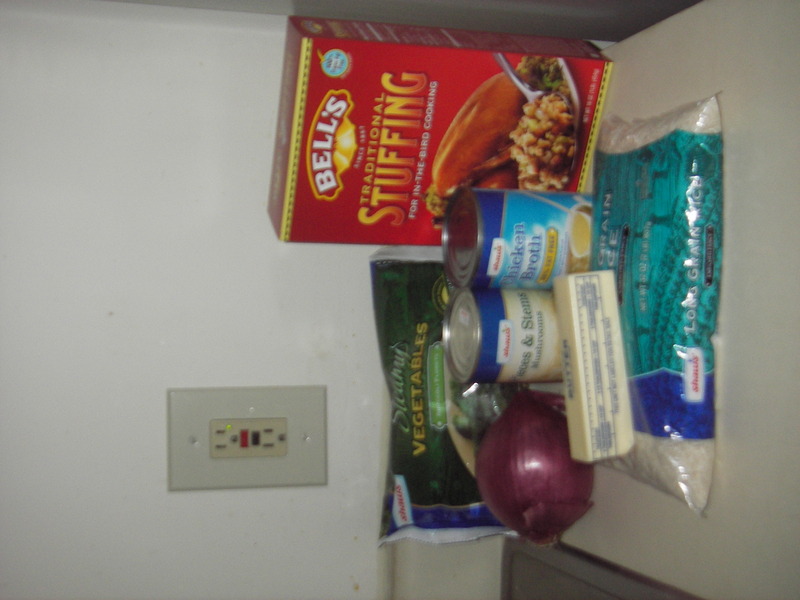 My search for the perfect stuffing continues! 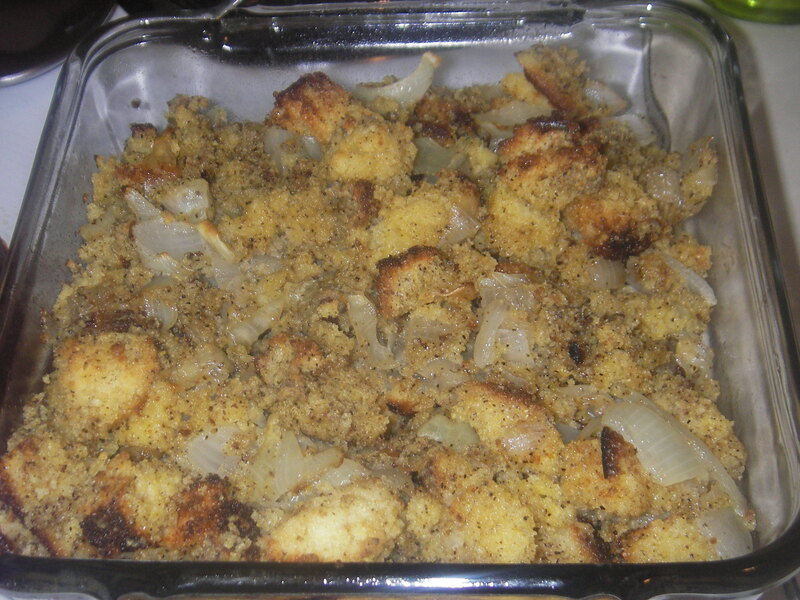 Today’s adventure was The Food Network’s Caramelized Onion and Cornbread Stuffing. I have to admit, I haven’t settled on one for sure yet, but this was one for the books. It was also super easy, even if it did set off my smoke alarm, but more about that later. I started by making my Honey Cornbread Muffins. I used 8 of them in this stuffing. After they cooled, I set to work on the stuffing. I began by chopping up both onions. 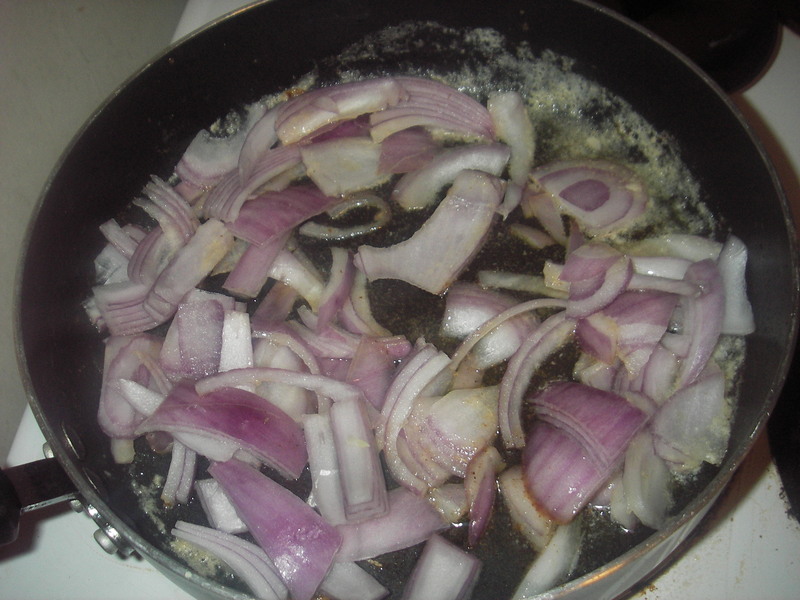 Then I melted the butter in a saucepan, and put in the onions to cook. 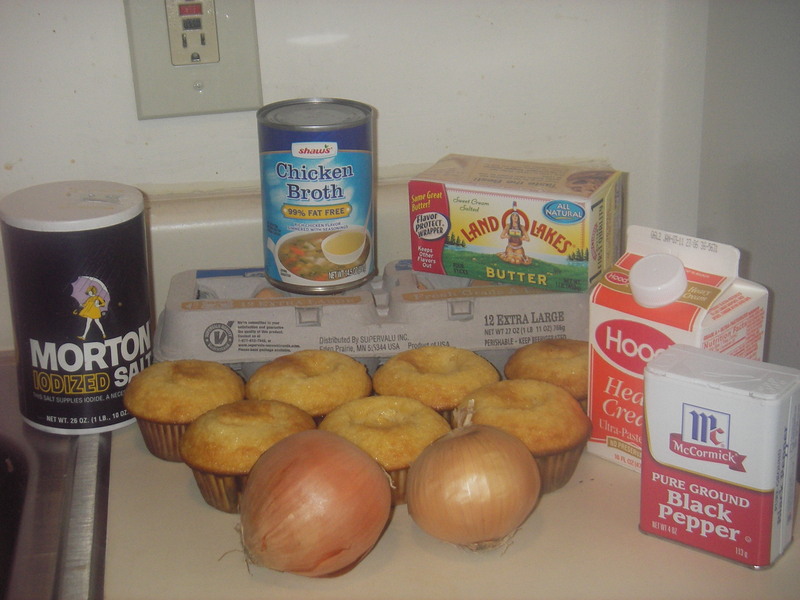 As the onions cooked, I set to work cubing the cornbread muffins. 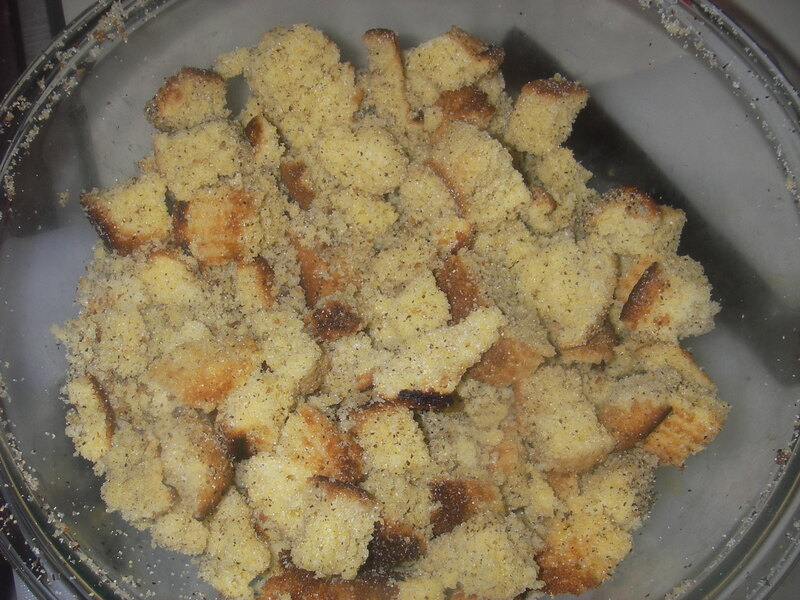 Once I had cubed the muffins, I put them into a bowl with a tablespoon of salt, and another tablespoon of pepper, and tossed them, so that they were coated evenly. The onions were still cooking, so to speed up the process I turned the heat up. While they continued to cook, I set to work whisking together the egg, heavy cream, and chicken stock. Insert, blaring smoke alarm here! Oops! Apparently, when onion is cooking on high heat, with butter in a saucepan, smoke happens. LOTS of SMOKE HAPPENS! On went the fans, off went the stove, up I went on the step stool waving a potholder at the smoke alarm. And it kept going, and going. Down I went off the step stool, and open went all the windows in my apartment. the smoke alarm eventually went off, but I’m fairly certain my neighbors want to kill me. Oops! 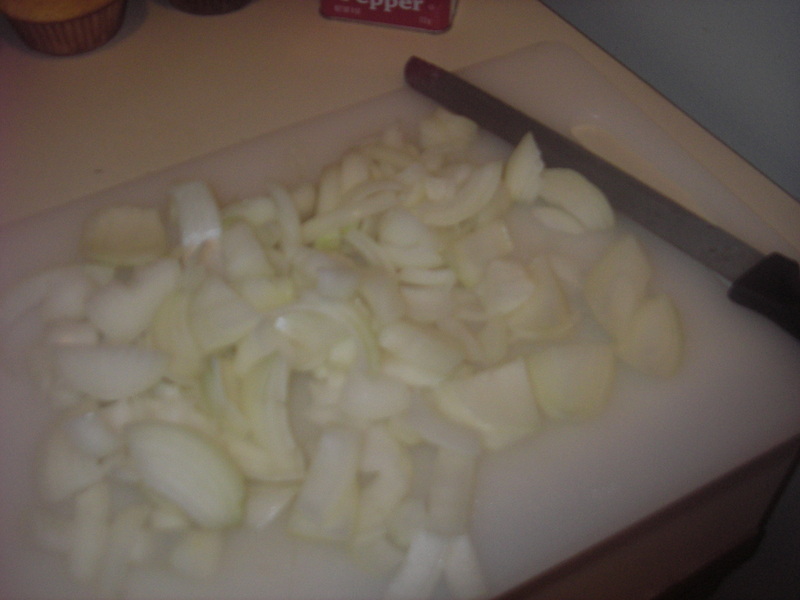 Once, everything was under control again, I continued to cook the onions on LOW heat. 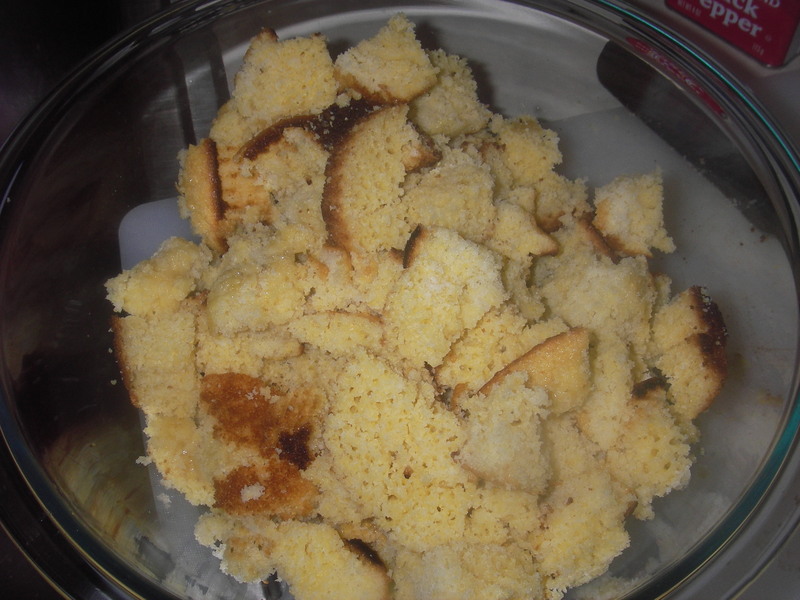 Once they were soft I added them to the cornbread cubes. 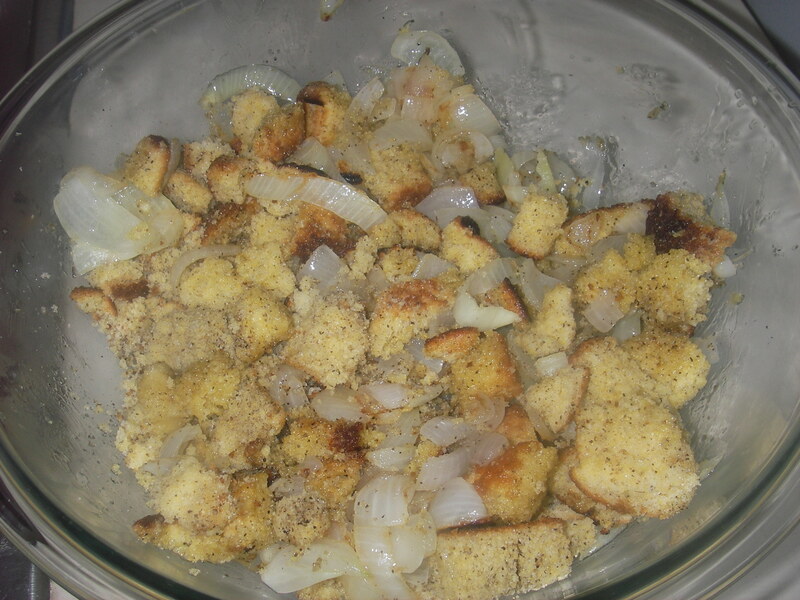 Once the cornbread and onion was mixed thoroughly, I poured the egg, heavy cream, and chicken stock mixture over the cornbread. Then I thoroughly blended the mixture, and spooned it into a baking pan. I baked the stuffing at 375°F for about 30 minutes. The cornbread was just a little brown when I took it out. This was completely delicious, and one of the perks is that if I had used vegetable stock, it would have been a vegetarian dish. I know there aren’t a lot of those on Thanksgiving, at least not with my family, so this would be a nice edition. 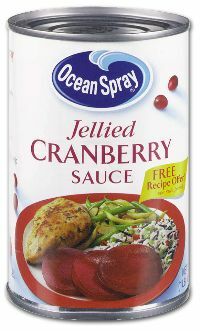 If you are having any vegetarians for Thanksgiving dinner I highly recommend giving this a try. 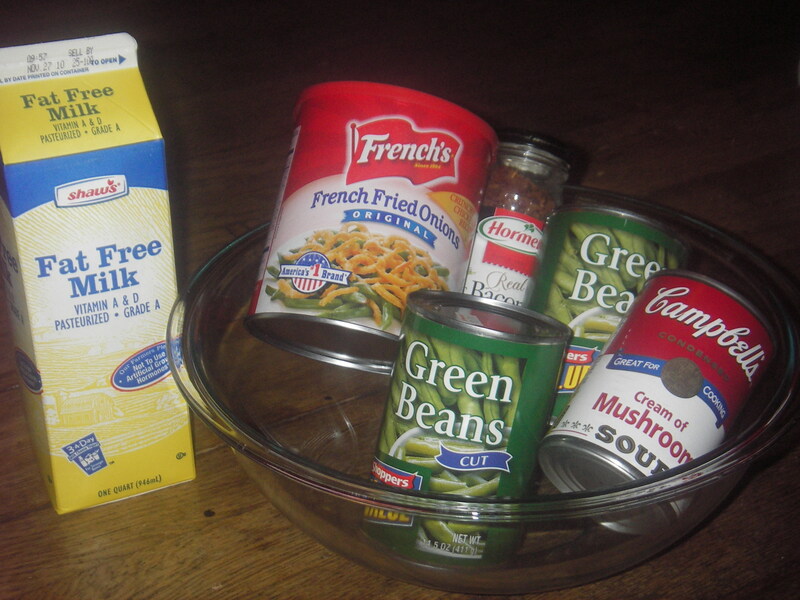 Actually, I highly recommend this stuffing even if you don’t have any vegetarians coming for Thanksgiving dinner. 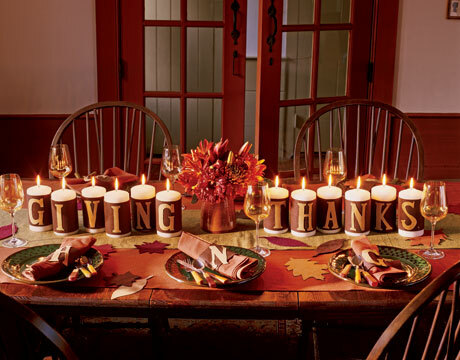 This is definitely a treat I want on my dinner menu, but stay tuned, because there are more delicious Thanksgving dishes to come! 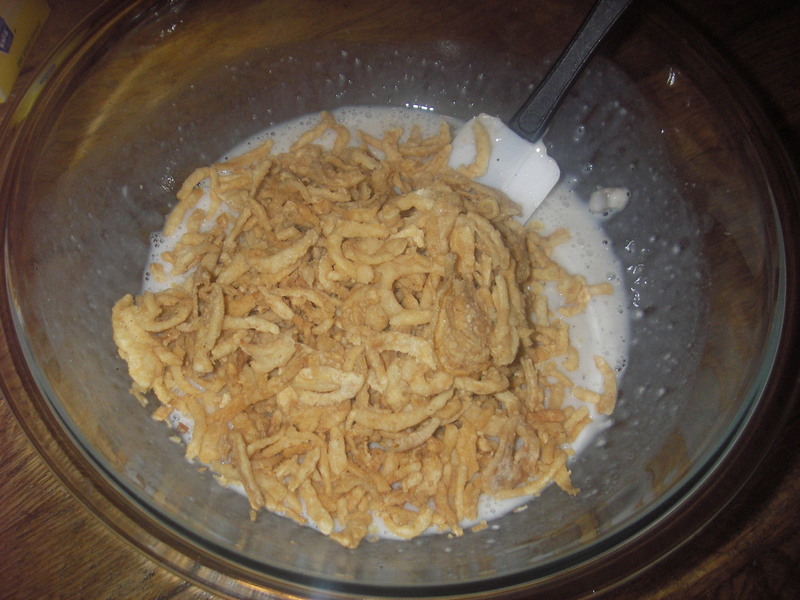 I started by combining the Cream of Mushroom soup, milk, 6 ounces of french fried onion, bacon bits, and black pepper in a large bowl. 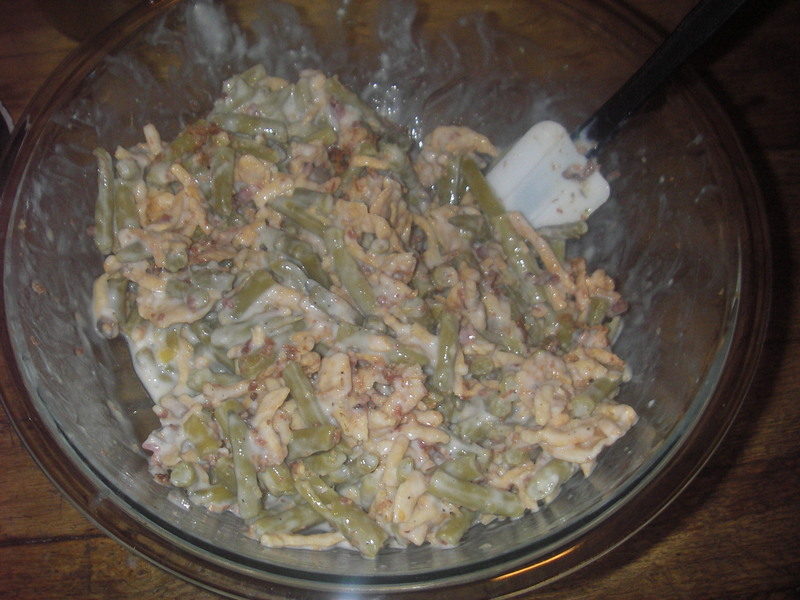 Then I added the 2 cans of drained green beans. 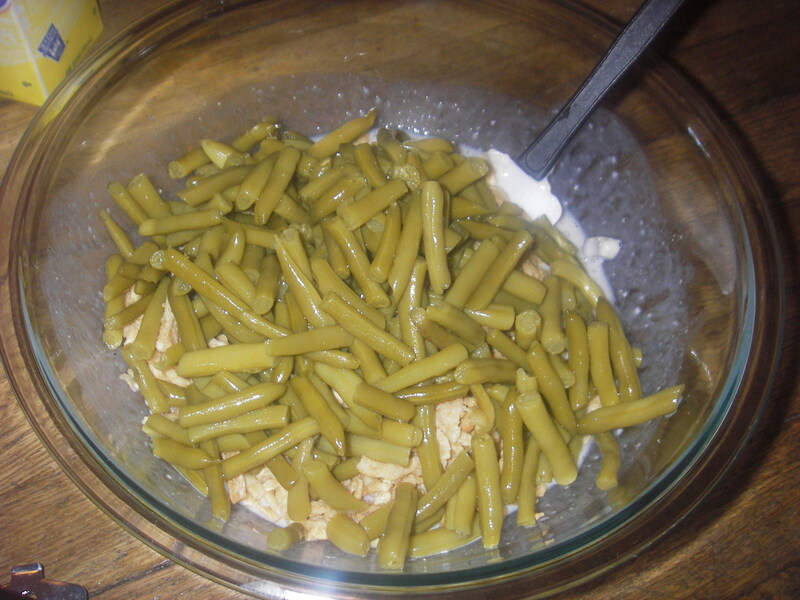 I then combined the entire contents of the bowl, and poured it into a baking dish. 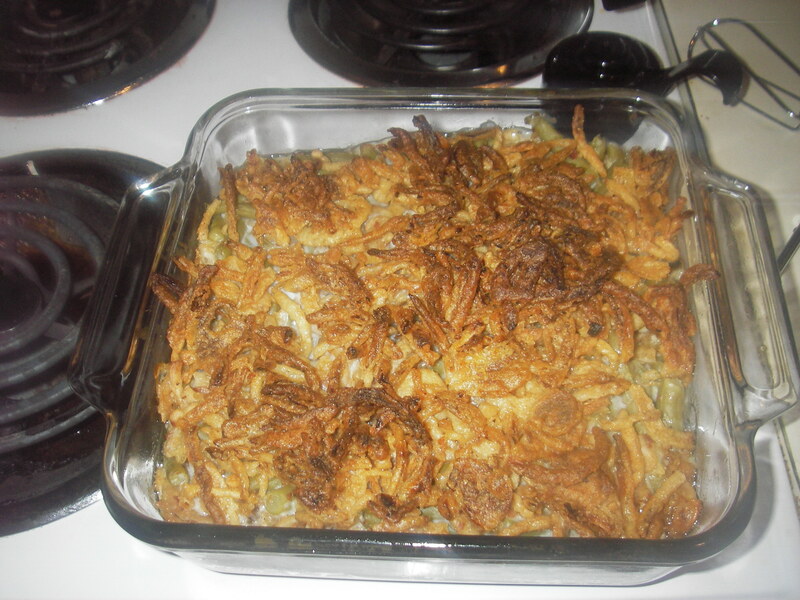 I then topped the mixture in the baking pan with the rest of the french fried onions. The casserole was then baked at 350°F for 30 minutes. This was delicious! Though I have to admit not as delicious as my father’s. 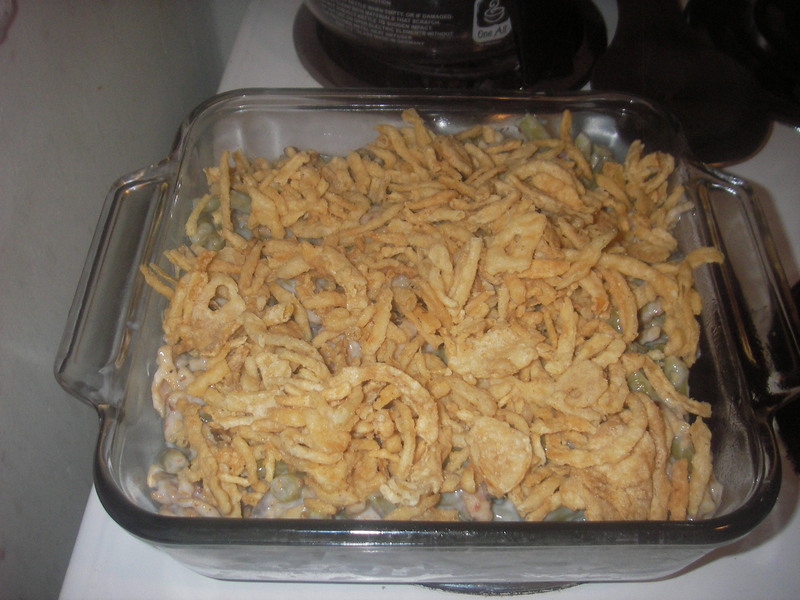 I may need to launch a recon operation in the kitchen on Thanksgiving, to find out what exactly my father puts in his green bean casserole. Once again, I am the girl with a plan! 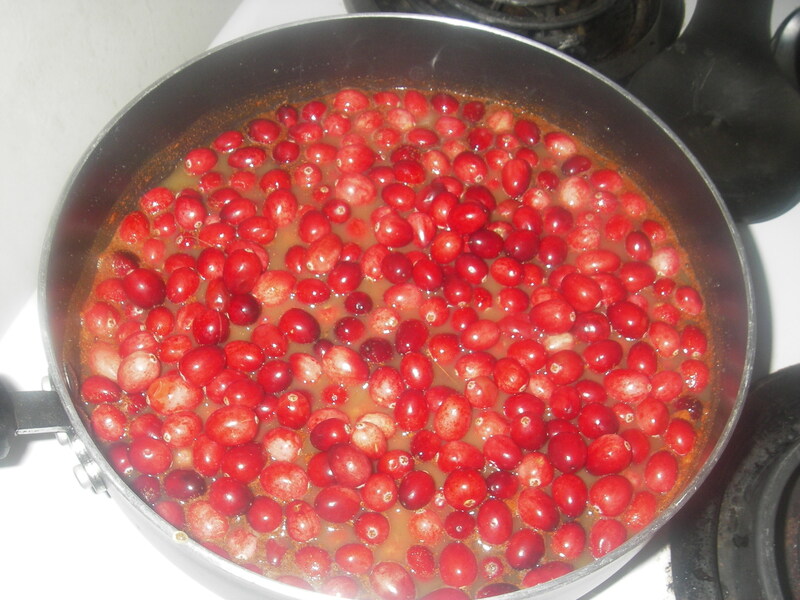 Cranberry Sauce was one of my sister’s and my favorite parts of Thanksgiving, however in our house it looked a lot like…. 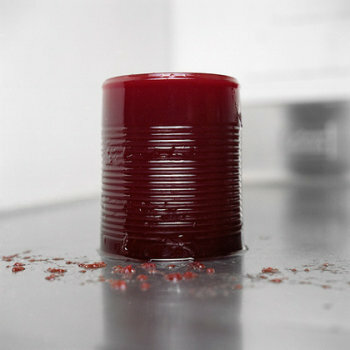 It just wasn’t Thanksgiving in our house unless the cranberry sauce had lines in it. Always the adventurer, I decided to go with this take on the recipe. 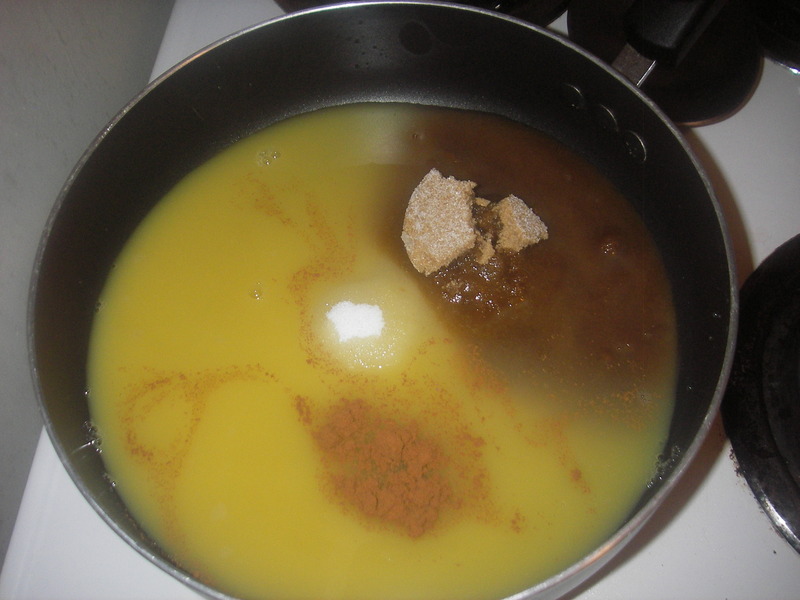 I started by combining the sugars, cinnamon, and orange juice in a large saucepan. 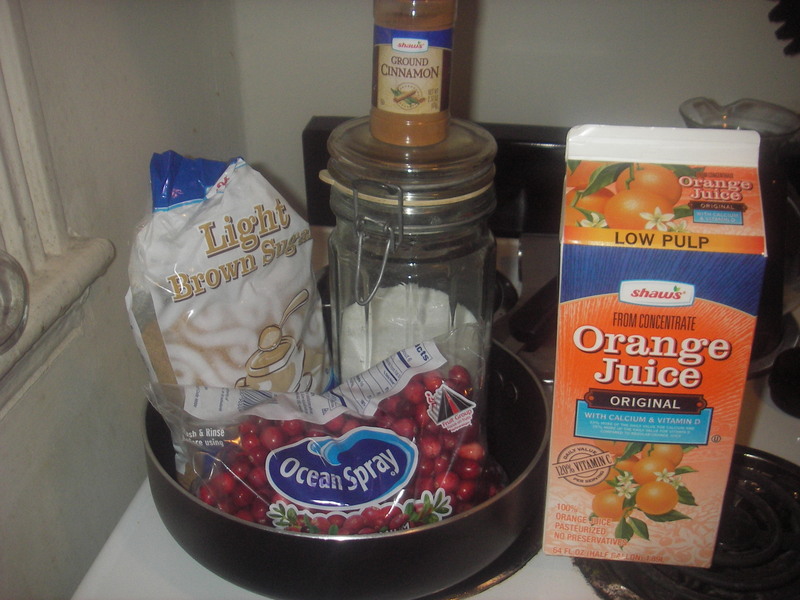 I then heated the mixture on medium heat until the sugars and cinnamon dissolved in the orange juice. 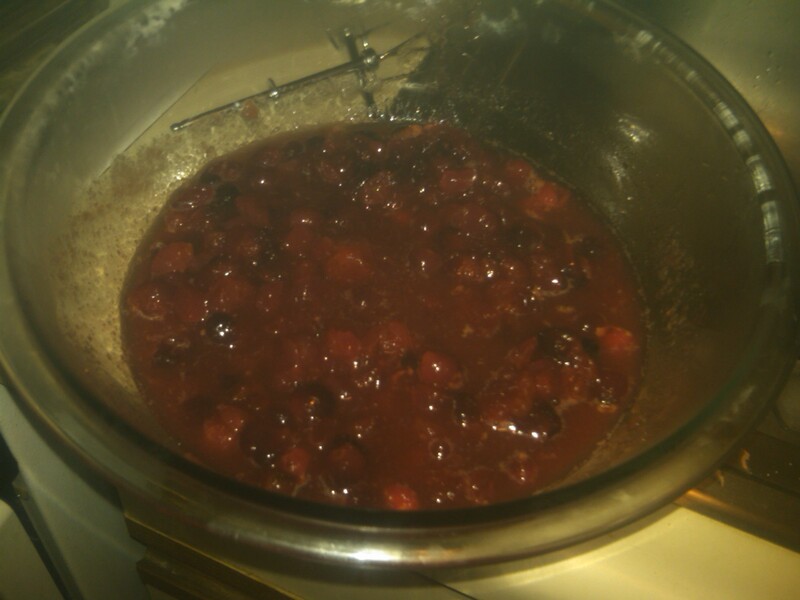 Once the sugars and cinnamon were dissolved, I stirred in the cranberries. I then turned the heat up, and covered the saucepan. 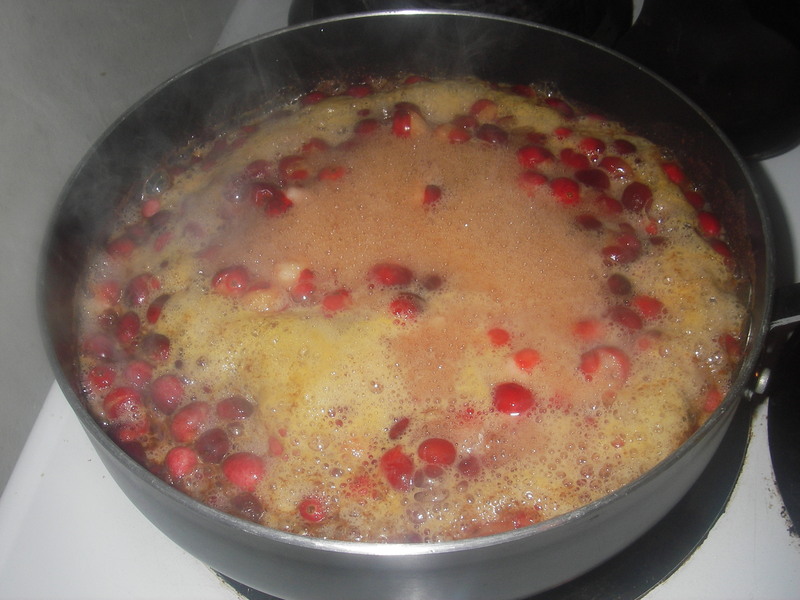 Then all I had to do was wait for the cranberries to POP! 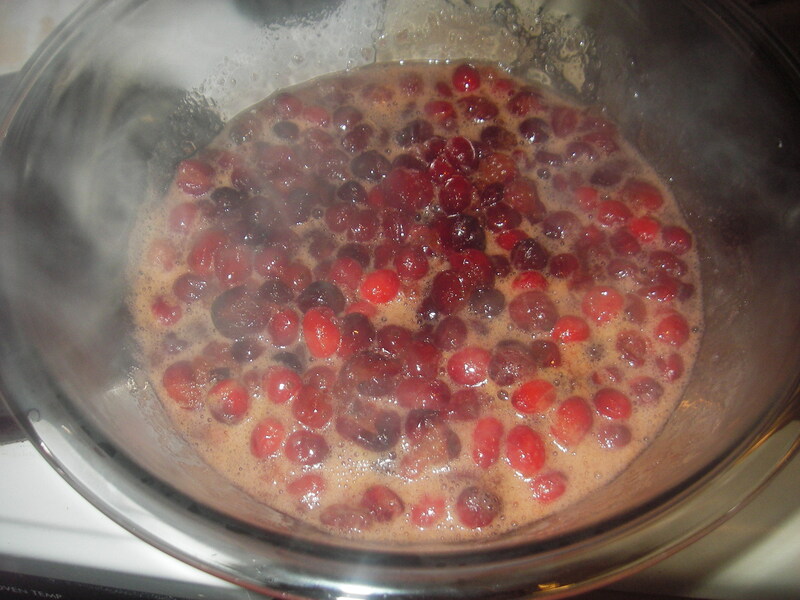 After about 10 minutes, all the cranberries had popped, and I removed them from the heat, and poured the contents of the saucepan into a bowl to cool. 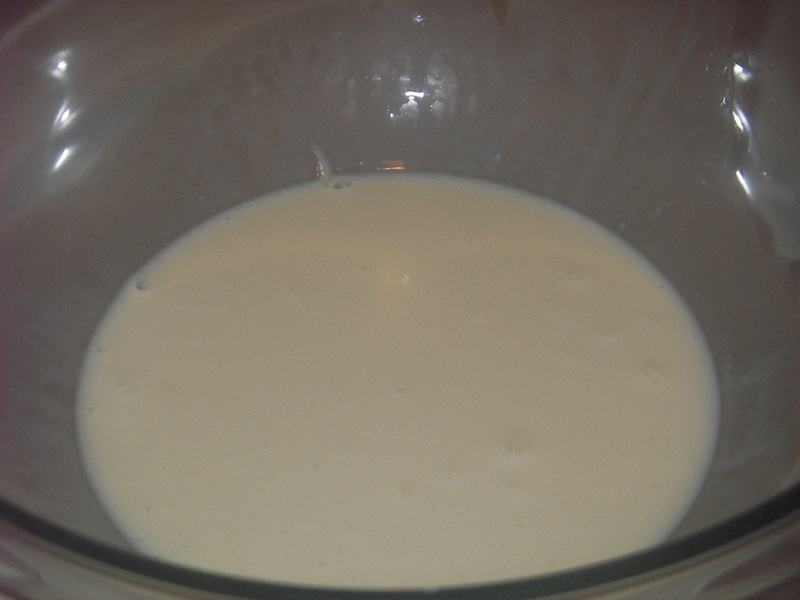 As the sauce cools it will thicken, and when it is completely cool it can be served. I’m a little sad that it won’t have lines on it, but it sure looks tasty. It also tastes tasty. I could certainly make a case of this on my family’s Thanksgiving table, though I’m sure it will end in a taste test. I hope you are all enjoying getting ready for the approaching holiday! There’s nothing like the PERFECT stuffing to compliment an AWESOME turkey! I decided to start the hunt for the perfect stuffing early this year, and this was experiment one! 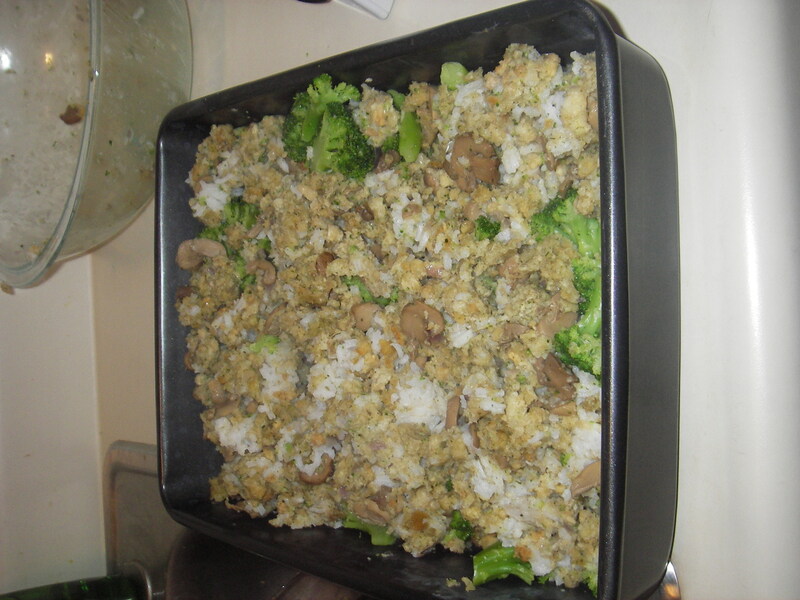 I found this recipe on allrecipes.com, they refer to it as Leslie’s Broccoli, Wild Rice, and Mushroom Stuffing. 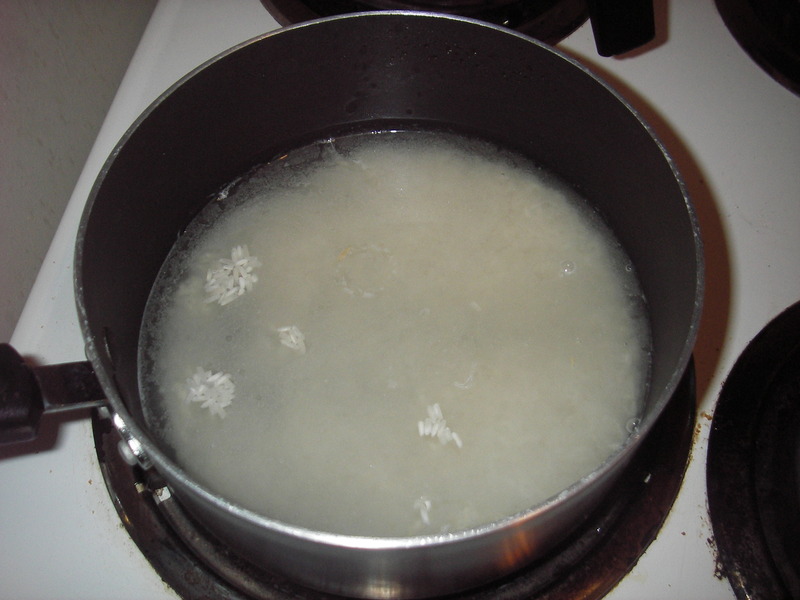 I combined the rice and water in a pot, and brought it to a boil. I then reduced the heat to low, and let it simmer for 45 minutes. 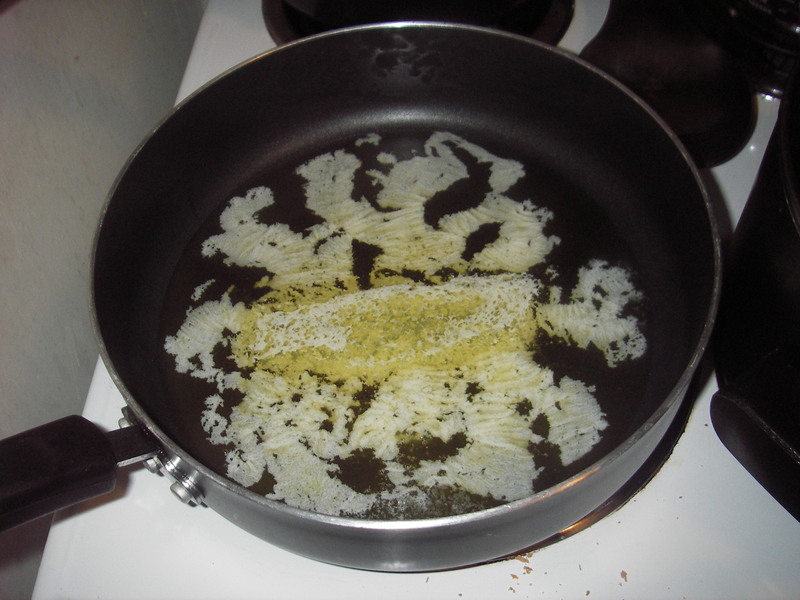 When the rice had about 15 minutes left I placed the butter into a skillet, and melted it. 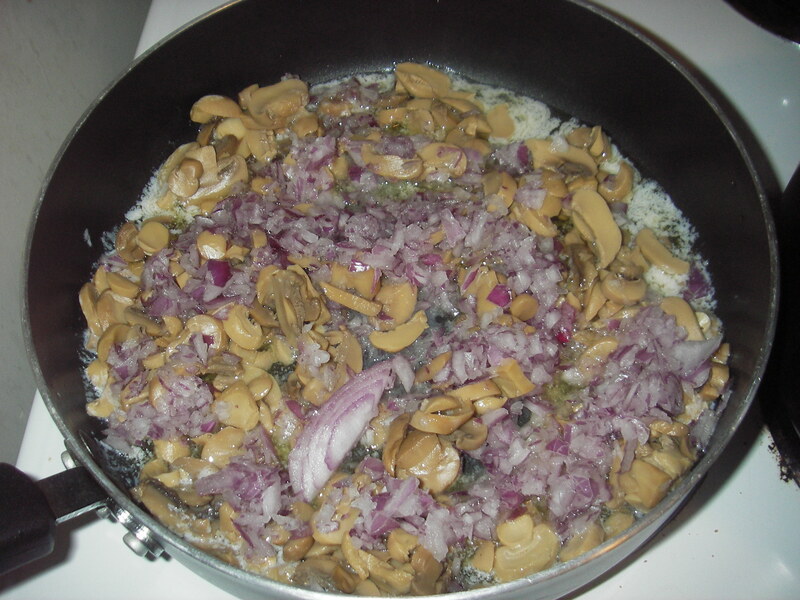 I then sauteed the onion and mushrooms. When the rice had about 10 minutes left I put the broccoli in a large pot, with just enough water to cover it, and boiled it for about 5 minutes, or until it could easily be cut. 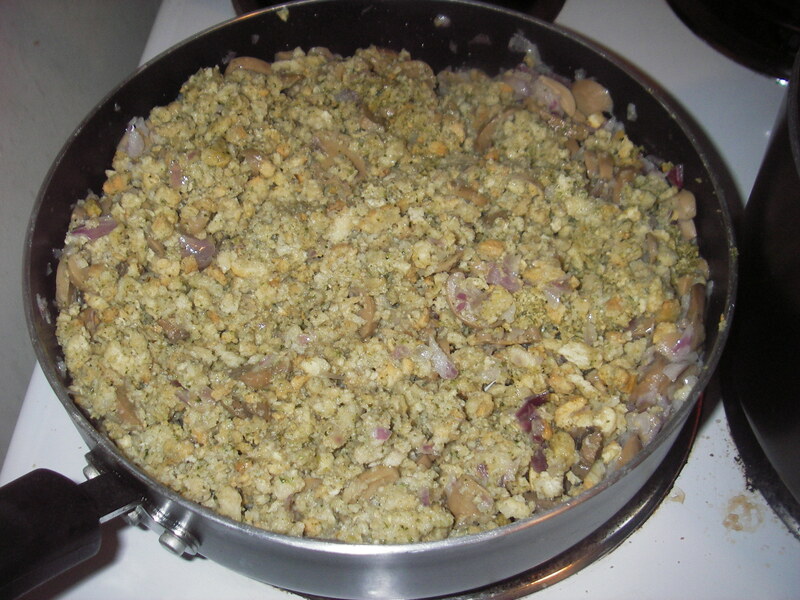 Once the onion and mushrooms became tender, I added the stuffing mix and chicken broth, and heated the mixture until it was hot through. 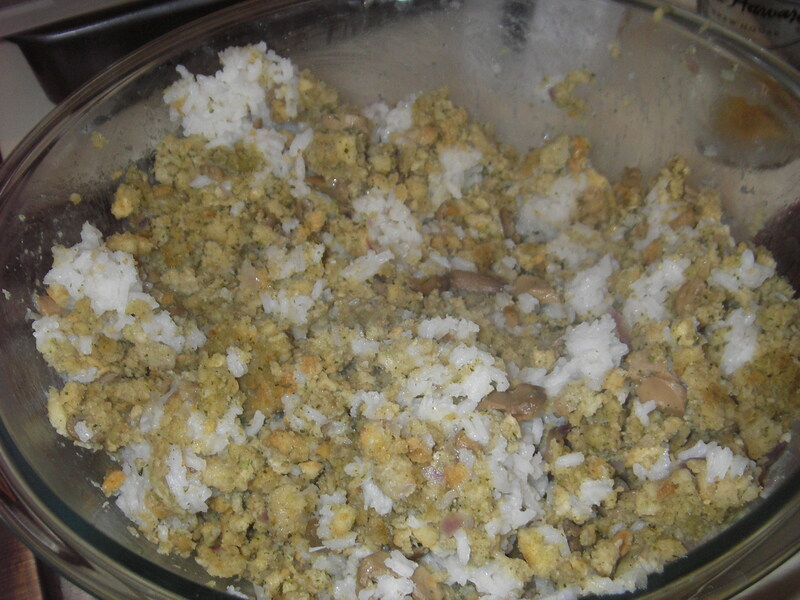 When the rice was done, I poured it into a large mixing bowl, and then added the onion, mushrooms, and stuffing mixture. 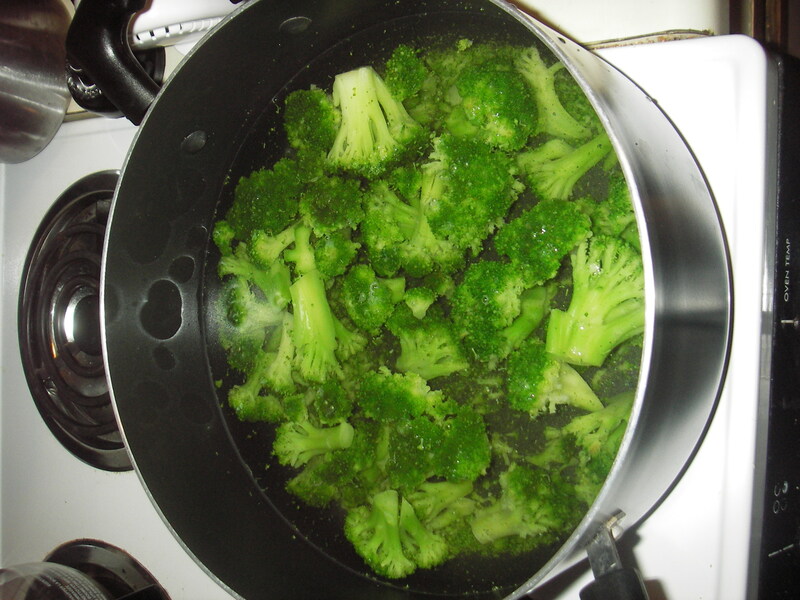 When the broccoli was done, I drained the water, and added it to the large mixing bowl. Once everything was combined well, I poured it into a baking pan. Ready for the Oven, or the Bird! Since I didn’t have a Turkey to stuff…this time. I baked the stuffing for 30 minutes at 350°F. This was an AMAZING first try! 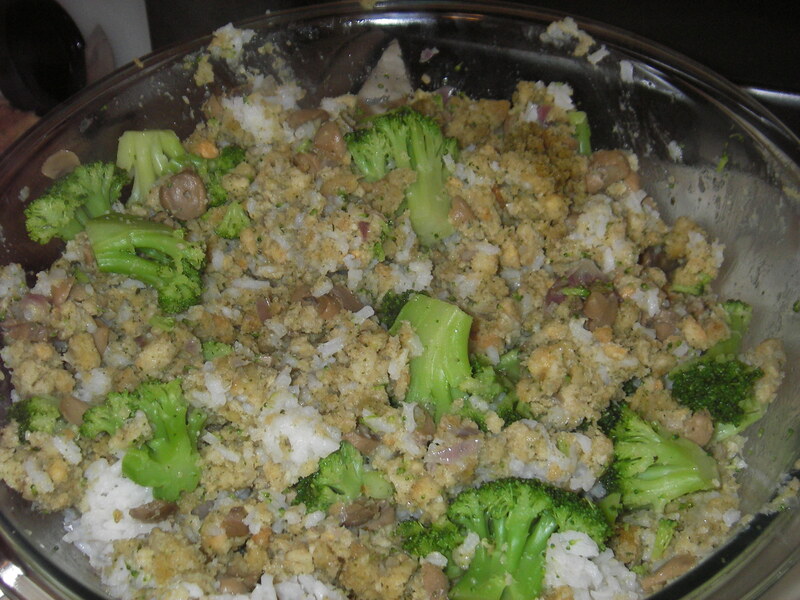 Though if this is the stuffing I select for my turkey, I won’t be using the broccoli. I’ve come to the conclusion that broccoli is a separate Thanksgiving side dish. 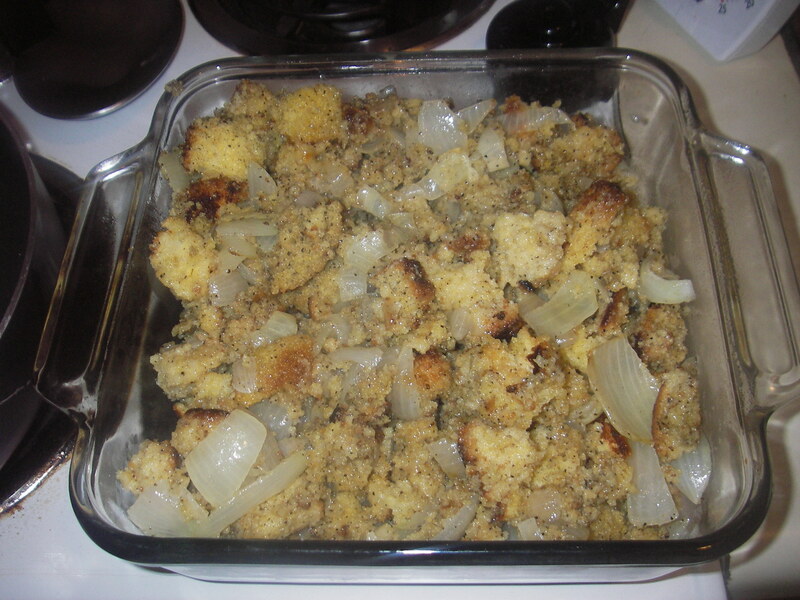 This stuffing had a lot of flavor, and was very filling (it was my dinner). I might try adding more broth next time as well, or not baking it as long, as it was a little dry. We’ll see what happens after I try my other stuffing experiments! 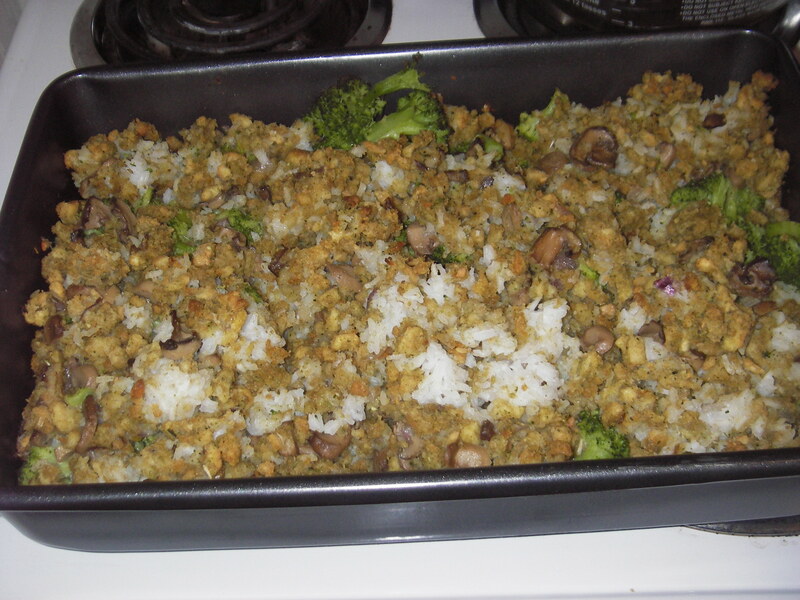 What kind of stuffing do you make/have with your turkey at Thanksgiving? Let me know, because I’m taking suggestions. This entry is dedicated to one of my best friends! Thanks Steph! She introduced me to one of her friend’s cooking sites, and I discovered this SUPER YUMMY dish! I should note here that Steph’s friend is from Australia, so this recipe needed to be tweaked a little, and by tweaked I mean Celsius had to be converted to Fahrenheit, and kilograms had to be converted to pounds, but here’s my take on the original recipe for Warm Sweet Potato and Red Onion Salad. 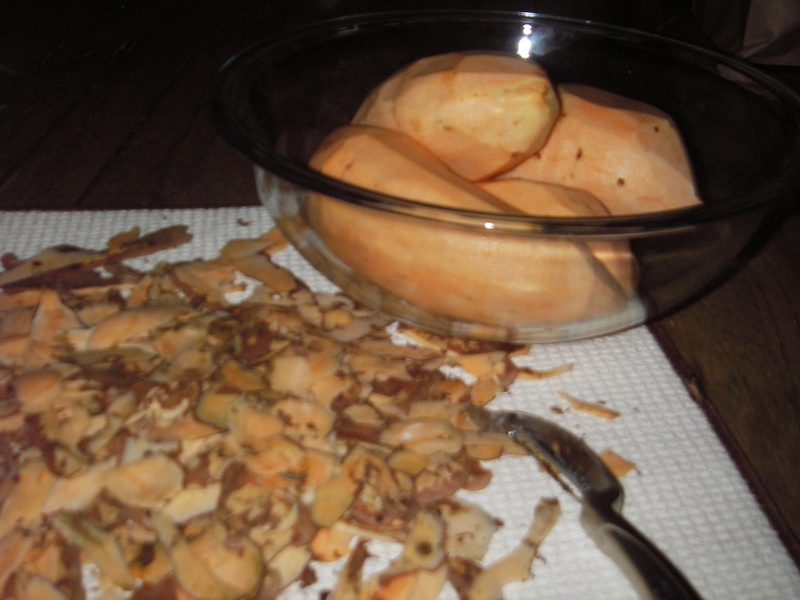 I started by peeling 4 large sweet potatoes (about 4 pounds), then I sliced them into bite-size cubes. 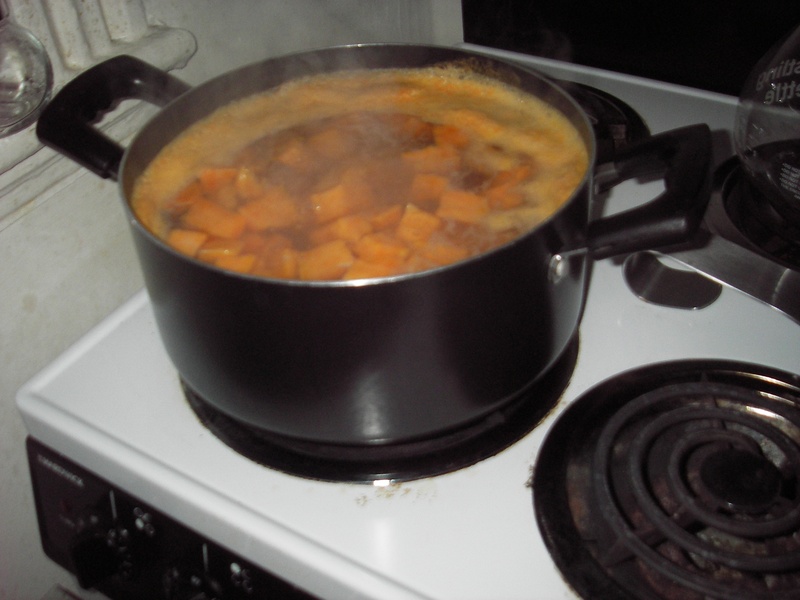 Then I placed the sweet potatoes into a large pot, covered with water, and boiled until the sweet potatoes were just soft. 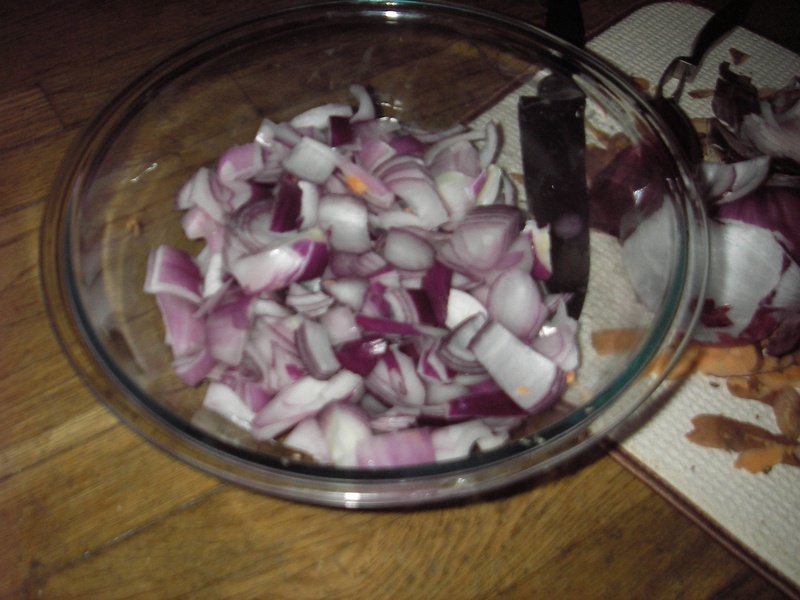 While the sweet potatoes cooked, I cut the red onions into thick wedges, and placed them into a large mixing bowl. I then covered them with 2 tbsp. of balsamic vinegar and 2 tbsp. of olive oil, and mixed them. 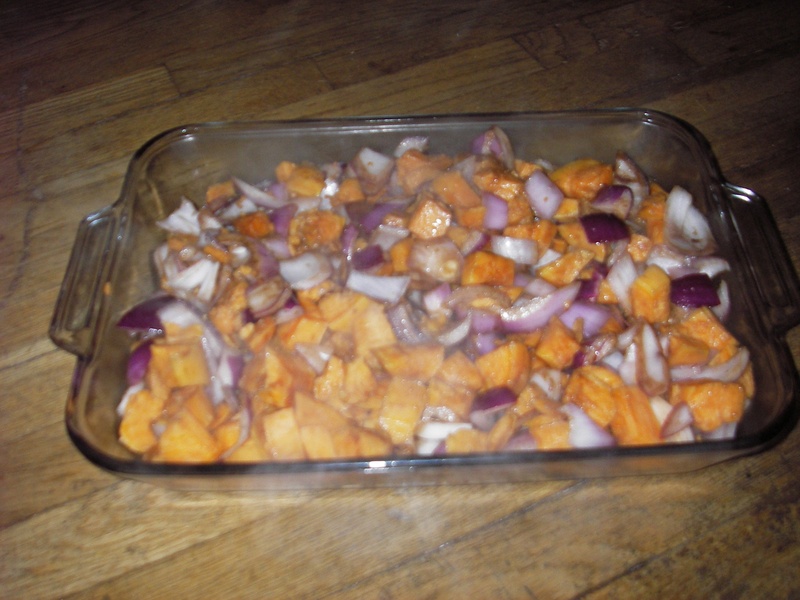 Once the sweet potatoes were slightly soft I drained the water and added them to the red onion in the large mixing bowl. I them poured another 2 tbsp. of olive oil and 2 tbsp. 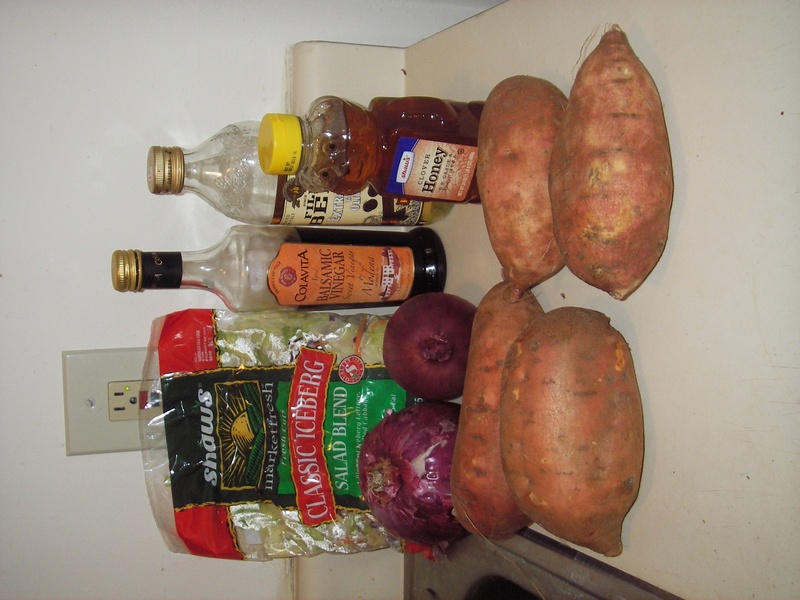 of balsamic vinegar over the sweet potatoes and thoroughly mixed the red onions, sweet potatoes, balsamic vinegar, and olive oil. 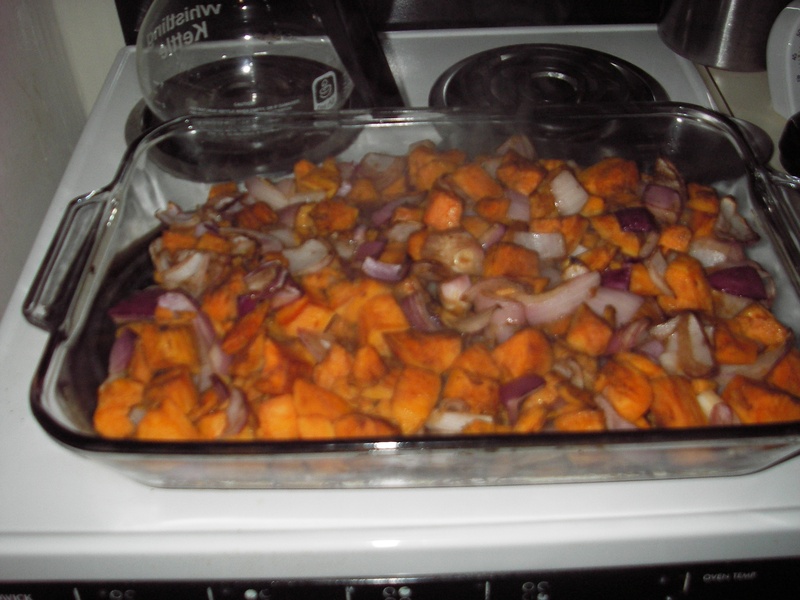 Then it was into a baking pan for the mixture and baked it at 375°F for 35 minutes, or until the sweet potatoes were golden brown. 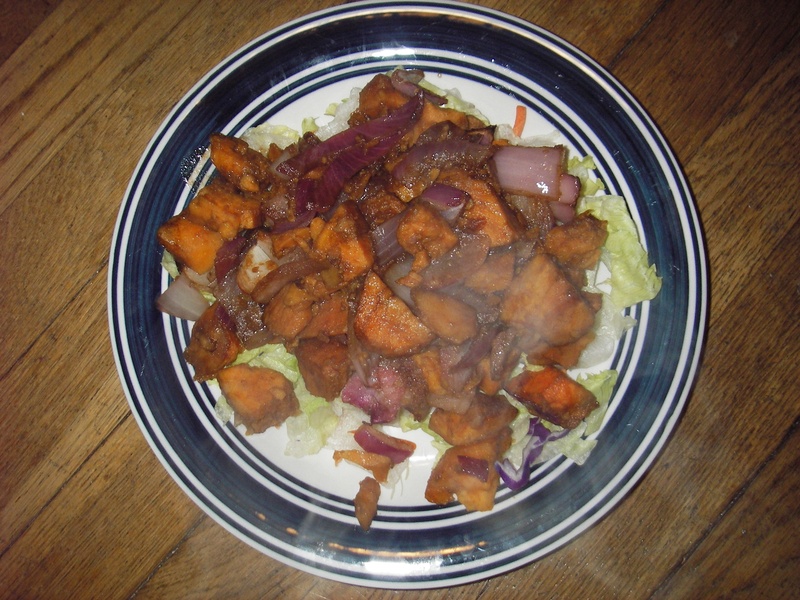 I then took the bag of mixed salad, poured it out onto a large platter, and poured the sweet potato and red onion mixture over the salad leaves. Then I evenly drizzled 2 tbsp. of honey, and 2 tbsp. of balsamic vinegar over the entire salad. I then tossed the entire salad, as you would any salad, and then served while still warm. This was a completely delicious meal, that’s right, I said meal! I hadn’t intended it to stand alone, but there was so much of it, I made it into a meal for myself. There is enough to last me a few meals too, which I totally love. There’s nothing quite like being able to come home after a long day at work or school and just have to microwave a good meal. I intend on using this as a mid-afternoon, pre-turkey salad on Thanksgiving too, I just hope my family and friends LOVE it as much as I do. Hope all you Foodies love it too! Stay tuned for a classic Thanksgiving pie next! Welcome to the MOST Foodelicious Time of the Year! As I’m sure those of you that have been following my blog have noticed I’ve been creating some VERY seasonal dishes, well this month is going to be no different! 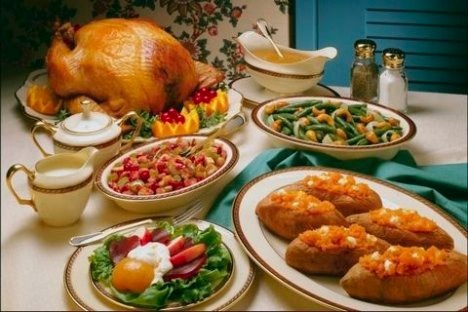 I have decided to step up my game and instead of sitting on the couch with various members of my family on Thanksgiving Day indulging in some very athletic and parade oriented entertainment, while my mother mans the kitchen, I am going to help out. Now, we all know I don’t like to do anything on a small scale, so in order to do all this right, I’m going to need to practice. As I said this is just what I have so far, so if you see something that you think needs to be added (or subtracted) let me know. The idea is for all my favorite foodies to go home for the holidays and WOW the people in their family that usually cook. The only thing left to say at this point is…who’s with me! ?